What has been your experience with Ignatian contemplation? Positive? Needs practice? Never tried? I read the scripture and, without planning, I felt myself as John within the womb of Elizabeth. I sensed something – the presence of Jesus – and jumped for joy. Ever since that time I find myself reading the scriptures in a different way, a way also influenced by my experience with the poor. 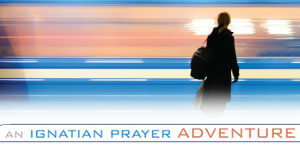 For more on this form of prayer, read “Pray with Your Imagination” by David Fleming, SJ. Taking the Red Line to celebrate my sister’s birthday on Ascension Sunday. our Pope and all who can see with Jesus’ eyes.